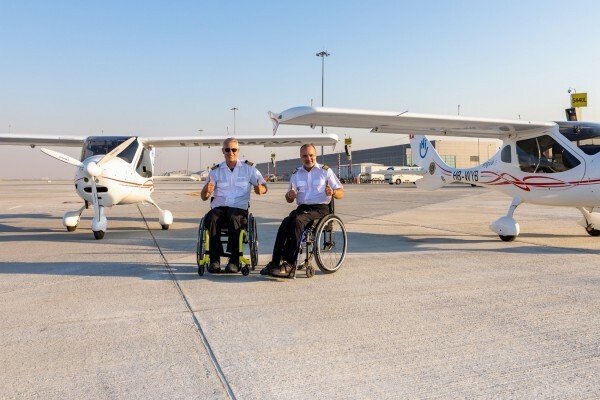 Dubai Airports, Execujet and Lions Clubs International officials gave a warm Dubai welcome to the two determined aviators who are piloting small aircraft around the globe in a bid to raise awareness for the inclusion of People of Determination (people with disabilities). The project, organised by Lions Clubs International, has a clear objective of globally promoting the inclusion of people with disabilities to combat discrimination and to raise funds for the association Humanity & Inclusion. The two pilots, South African Mike Lomberg and Guillaume Feral from France - both of whom use wheelchairs, will cover 80,000 kilometres in nine months across 40 countries and six continents via 150 staging points. The support team to this initiative are all former members of the Solar Impulse Project and all volunteers. "Dubai Airports is an enthusiastic advocate for the rights and inclusion of People of Determination in society. We are proud to be associated with this worthy cause and salute these pilots for their skill and commitment to this important mission," said Essa Al Shamsi, Vice President of Terminal Operations at Dubai Airports. The Handi-flight team is making a five-day stopover in Dubai allowing them to connect with local officials and media to promote their cause. They will also be attending Lions Clubs International’s Constitutional Area Forum, which will be held in Dubai bringing together 3,000 delegates from Africa, the Middle East and the Asian sub-continent. During their stay, Dubai Airports and Execujet will be sponsoring aircraft landing, parking and handling.